Every day, we receive hundreds of pounds of day-old produce donated by two grocery stores. Yesterday, an employee at one notified us that a 60lb pumpkin had failed to sell and did we want it? Um, do pigs love food? Yes! 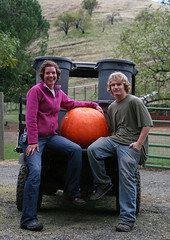 Abby, sanctuary supervisor and Louie, animal caregiver, took a picture with the giant gourd. And then it was time to abandone the pumpkin to its fate. Enjoy! The pigs and cattle sure did! I <3 Gilbert so much. I love his "ew" face. Also, ZOMG PIGS. I always forget how huge pigs are, and then I see them next to a 60lb pumpkin and I'm alL "OMG PIGS. THEY ARE LARGE." i love the picture where the pig has his entire head inside the pumpkin! yay for donations! when grew pumpkins the vines got infested with bugs and died, but puppy happily munched thru the two little apple sized pumpkins that had tried to grow.